By Andy Home, columnist for Reuters. Tesla, the pioneer of the electric vehicle revolution, is turning to Chile to secure the lithium it needs to power its mass production drive. Tesla and Chilean lithium producer SQM are "exploring" opportunities after the automotive company expressed interest in buying "important volumes" of the battery ingredient, according to Eduardo Bitran, head of Chilean development agency Corfo. It's an obvious place for Tesla's chief executive, Elon Musk, to look for secure supply. The global lithium mother-lode is in the brine lakes of Chile's Atacama desert. And the biggest obstacle to its full development potential has just been swept away with the resolution of a long-running dispute between SQM and Corfo. The prospect of a wave of Chilean lithium supply flooding the market sent the share prices of other producers and prospectors spiralling lower. Lithium bulls, however, needn't worry too much just yet. Translating political breakthrough into production boom is going to take years. And right now the lithium supply chain is still massively stressed as it adapts to meet exponential demand growth from battery makers. Which is why Tesla is eyeing a direct path to the mother-lode. As ever with this company, the question is whether everyone else will follow where it leads. Chile is part of South America's "lithium triangle," home to more than half the known global reserves of the mineral and the historic production base of the "lithium oligopoly", namely FMC , Albemarle and SQM itself. The Chilean government was as slow as everyone else to see the electric vehicle (EV) revolution coming but last year sprang into action with an international tender for lithium processing projects and a green light for Albemarle to raise production. SQM's Chilean expansion plans, however, were blocked by its bitter dispute with Corfo, which allocates the country's lithium production licences. Rooted in political intrigue dating back to Chile's Pinochet era, the stand-off crystallized around a disagreement on royalty payments. The drama has been running since 2014, the two sides locked in on-off peace talks and arbitration court battles. The truce was announced on Jan. 17. In return for an overhaul of its corporate governance and a lift in royalties, SQM gets an increase in its production quota to 216,000 tonnes per year of lithium carbonate and the option of partnering with state copper producer Codelco on its untapped lithium prospects. The prospect of the Atacama mother-lode cranking up production sent tremors through the lithium investment community. 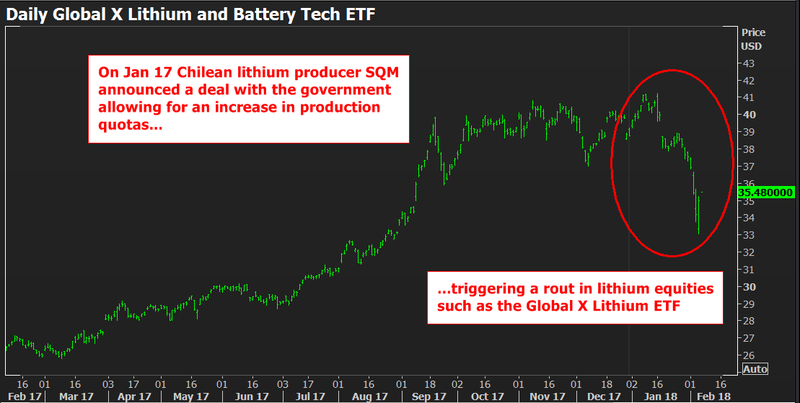 The Global X Lithium and Battery Tech exchange traded fund was trading above $40 before the news. It touched a low of $33.05 on Tuesday. Global X's holdings are largely of lithium blue chips. The hit on the junior sector has been more savage. But SQM can't switch on new brine capacity overnight, even if it wanted to. It is, moreover, currently focused on getting its joint venture Argentinian project into production by a targeted 2020. Any lithium surge from its Chilean operations could still be years away. And the status quo in the lithium market remains one of physical supply bottle-neck. Spot carbonate prices in China experienced another mini-surge over the second half of 2017, peaking at an average $26.18 per kg in December, according to Industrial Minerals (IM), part of the Metal Bulletin Group. That was just short of the levels trading at the height of the original 2016 lithium scare, when exploding prices first grabbed the world's attention. Once again it's a sign of supply chain stress. The recent tightness, totally unexpected, according to Martim Facada, lithium market reporter at IM, was down to competition for different forms of lithium and processing constraints. A production creep away from lithium carbonate towards higher-specification hydroxide has left the carbonate chain short of units. The tension was extreme enough in September to lift the Chinese spot carbonate price over that of hydroxide for the first time ever, according to Facada. Meanwhile, the wave of new lithium supply from Australia's growing band of hard-rock miners is crashing into China's processing limits. "Just selling to China is not the end of the story, it's just the beginning," Benchmark Minerals writes. The transformation of lumps of rock into battery-grade lithium compounds is a long and winding technical road, requiring experienced navigation. Chinese processors were already working close to capacity last year, while the companies with a proven technical track record capable of building new capacity "are few and far between", Benchmark Minerals says. 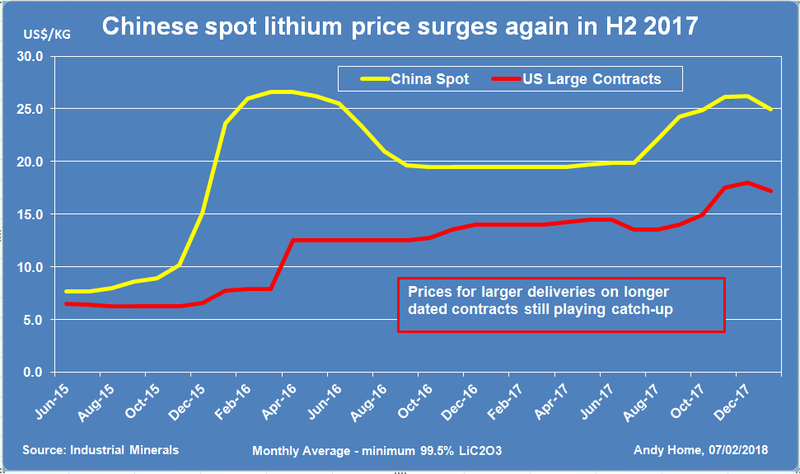 It may not feel like it to the owner of shares in a lithium junior, but the lithium bull market is marching remorselessly onwards, with prices outside of China still playing catch-up. TESLA – LEADING THE WAY? Which is why, of course, Tesla is so interested in cutting its own lithium supply deal at its source in the Atacama desert. The immediate outlook for the lithium market is for more disruptive volatility. Competition for units, meanwhile, is only going to become more intense as ever more automotive companies take their EV pledge. So far none, according to Benchmark Minerals, has actually locked in long-term contracted lithium supplies. The current market battle is playing out between lithium producers and battery-makers. The end-users, the car companies themselves, have so far been largely by-standers. That looks set to change. And it's perhaps no surprise that Tesla, the self-acclaimed standard bearer of the electric future, is leading the way. Others will almost certainly follow, since the world's automotive sector is just waking up to the supply-chain challenges associated with mass production of electric vehicles. And if a straight-to-mine approach works in lithium, would it work for cobalt, another key battery input with an even more fragile supply chain dominated by the Democratic Republic of Congo? We may not have to wait long to find out.